Britain has a huge strength in its diversity. However, rarely is this noted positively. And forget about celebration - the impression we often get through the media is that it is a problem to be solved. There is a real concern with outlook and attitude. Difference should be seen as an opportunity. It is a source of great strength. It leads to creativity. It helps reap the benefits of globalisation. I took the initiative to educate and inform and have written a book ‘Celebrating Diversity', drawing from my 25 years of experience of living and working in Britain. In that time, I have obtained a professional business qualification, a Research Fellowship and PhD from the London School of Economics, contributed huge amounts of time and skills to many charities, been a Lecturer at prestigious Universities, and raised a family and advanced my culture and community. My life has been filled with very rich and powerful experiences, which I draw upon in writing this real and practical narrative. The book is aimed at any thoughtful and reflective citizen of Britain. It has chapters entitled: Spicy or Plain, God's Jargon, Its Illegal, Minds Wide Open, Love Thy Neighbour and Working Together - ending with ‘Our Common Future'. The book draws upon the pluralism of Indian wisdom which teaches us that all living beings are worthy of respect - not just humans. This unique perspective helps us to deal with difference and celebrate it - we definitely do not feel threatened by it. The book reveals the Indian formula of integration, assimilation and achievement, to the whole nation. It shows how respecting others helps us to grow. It encourages dialogue and engagement - we can disagree without being disagreeable. Just as we exercise our bodies, we need to exercise our minds - be willing to be criticised or questioned, and to travel to different parts and meet the locals and learn different languages. It teaches us to go beyond power, materialism and territorial thinking to an approach which is inclusive, open-minded and cooperative. Workplaces can be tense and stressful - as people from different cultures may have different styles and habits. However, goals can be common, and difference in approaches may lead to higher scores! Sometimes, there is tension where power needs to be shared and promotions awarded to people who are different in some way. The statistics in Britain show that representation in the private and public sector at senior levels, especially of ethnic minorities, is very poor. Often, the smart people end up leaving to start their own business or to work for a firm which is owned by someone from a similar culture because opportunities and progression are denied to them. As I am writing this article, I can overhear my eight year old son talking to an adult neighbour about his holiday. Meerav initiated the conversation with confidence and without fear - and there was dialogue and engagement as a result. Sadly, we often run away from this into the privacy and security of our semi-detached lives. And this can result in prejudice. "It is very illuminating to find someone who can share his personal life journey of living diversity on a daily basis in such an honest and authentic manner while threading through the text a sophisticated, thoughtful, integral and a complex analysis of the key issues of our time: including family and community relationships, equalities legislation, diet and health, politics, the media, organizational life and religious belief. No aspect of life is left untouched and commented upon. The personal experience of being a "minority" person - of having to "fit in" - of assimilation and settlement in three continents is mixed beautifully with a wide range of informative views, fascinating facts and figures, useful resource information and pertinent quotes from a wide range of sources including reports, lectures and academic research. We are left in no doubt of the importance of embracing and celebrating diversity and the advantages it can offer to every part of society, and to our own lives if only we take it seriously and adapt our actions, mindset and behaviors accordingly." The book makes for an ideal corporate gift to employees and customers and helps raise the awareness and profile of the strength and breadth of diversity in modern Britain. Read it and find out for yourself. 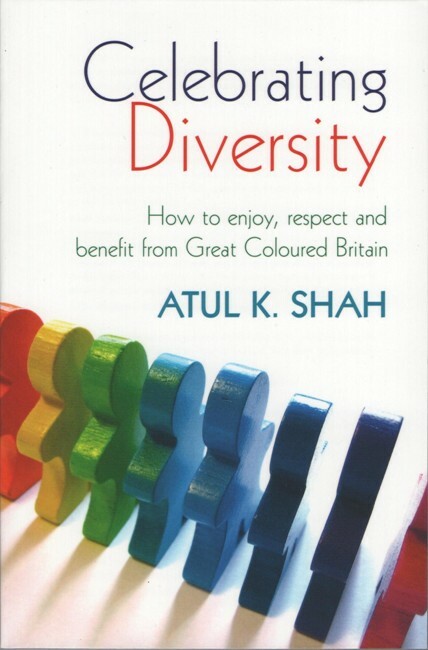 Dr. Atul K. Shah is a writer, broadcaster and Chief Executive of www.diverseethics.com The book is available on-line at Amazon.